We are Europe’s No. 1 for home fitness and have more than 2.700.000 satisfied customers throughout Europe. Sport-Tiedje is Europe’s largest specialist retailer for home fitness equipment and at the same time, we are one of the most successful and best-known online mail order companies for fitness equipment in the world. Our online shop is continuously updated and, together with 79 branches in Europe, the Sport-Tiedje Group offers more than 7000 Aproducts from the leading and the most innovative manufacturers as well as top quality exclusive and own-brands. At present, the Sport-Tiedje Group has more than 700 employees and continues to show strong growth. The head office of the company is in Schleswig, in the beautiful and historic Schlei region which is located between Flensburg (30 km away) and Kiel (50 km away). It offers a charming setting and a high quality of life because it is close to the North Sea, the Baltic Sea and the beautiful landmarks of the Schlei region. 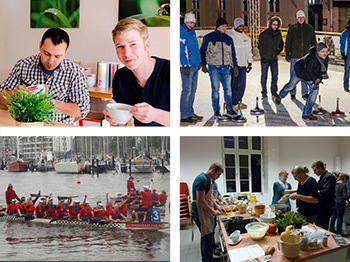 The Schleswig-Flensburg and Rendsburg-Eckernförde districts promise lots of cultural and sporting activities. You will find a brief outline at: www.ostseefjordschlei.de. Our branches are distributed throughout Germany and the neighbouring countries. In 11 languages, our online shop provides the total world of home fitness, with top quality content, innovative functions and a blog. In addition to this, we are happy to offerour customers the opportunity to try out the fitness equipment in our 79 branches so you can see which equipment best suits your ownneeds. And of course we would like to offer our customers someone who they can talk to directly and in person and who is located in the vacinity. We would like to give you a more detailed insight into our company and introduce ourselves to you through our company video. The Sport-Tiedje Group operates an open door policy and has a flat organisational structure. The management and the skilled workers are always ready to listen to those who work there. All news items from the world of Sport-Tiedje and also the internal newsletter, T-Inside, are shared with the 700 employees via the intranet. As we are at home in the sports sector, fair play is particularly important to us. We address each other informally but respectfully, in the same way as is usually the case in sport. In spite of our informal way of working together, our professionalisms forms one of the core pillars of the success of Sport-Tiedje. The Sport-Tiedje employees form the basis of the company’s success. Therefore, your training, development and career advancement are particularly important to us. For this reason, we have launched the Sport-Tiedje Academy so that we can provide the best possible professional and personal development. It offers regular training for the team so that they can get to know the new products and innovations. As our company is represented internationally, each employee also has the opportunity to take part in English courses. These in-house language courses are provided by the adult education centre and are at a variety of levels. Measures adopted to actively develop our employees include, for example, dual study programmes with Sport-Tiedje as a partner or advanced training in accountancy. Appraisal interviews and performance reviews also take place at regular intervals so that we can provide regular feedback. The family atmosphere at Sport-Tiedje is rated very highly. This is why we regularly take part in sporting events (such as dragon boat racing and the company challenge race in Flensburg). The Sport-Tiedje betting pool is hugely popular at each large sporting event (European and world football championships), and offers the employees the chance to win attractive prizes. At regular intervals we hold special fruit and muesli days to encourage healthy eating amongst the employees. The fitness cooking classes where tasty and healthy recipes are prepared with professional support are also very popular. There are also regular events that take place outside of the workplace. These include the summer fair and the Christmas party at the head office and in the branches where we have an enjoyable time together. As sport and fitness are the central theme at Sport-Tiedje, we offer the use of the studio in both Schleswig and Büdelsdorf, free of charge and in cooperation with the “Vitalien” fitness studio (www.vitalien-schleswig.de). As well as the machines for building endurance and strength, there is also, of course, the wellness area where you can relax and unwind. here is also a wide range of courses on offer.